Crepes are a wonderful addition to the breakfast table, but the thin, tender pancakes are versatile enough that they can make an appearance at any meal. Crepes stuffed with ham and cheese can be a savory meal any time of the day, while cinnamon sugar crepes are a delicious breakfast or snack item. When it comes to dessert, you can make things a little more indulgent with these Chocolate Crepes instead of their plainer cousins. 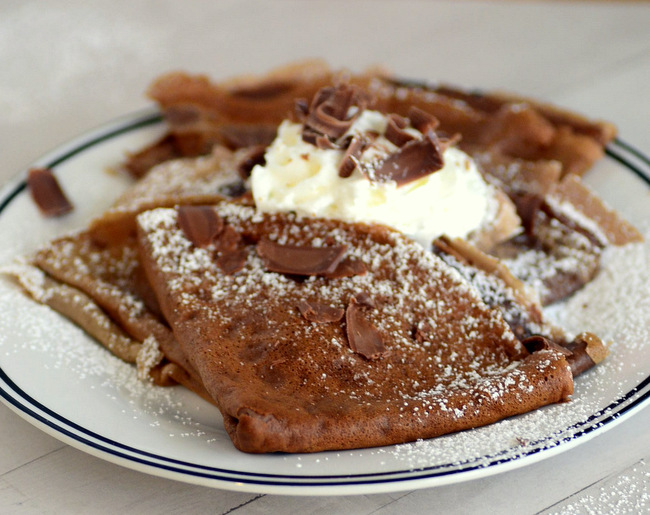 Crepe batter is very quick and easy to make – and these chocolate crepes are no exception. The batter is very similar to that of traditional crepes, but it has a little bit of cocoa powder and vanilla added to it. The crepes can be whisked up in one bowl or made in the food processor. The food processor really streamlines the process, so I tend to use it when I need a double batch of crepes. You can use the batter immediately or let it sit in the refrigerator over night if you want to make it ahead. These crepes are not particularly sweet on their own because there is very little sugar in the pancake recipe. Too much sugar in crepe batter can lead to crepes that are crisp, rather than tender. The chocolate flavor of the crepes starts to come through when you add fillings and toppings to the crepes – and there are many delicious ways to do that. The simplest way to serve these is to add a bit of butter and sprinkle them very generously with confectioners’ sugar. Another outstanding serving option is to fill the crepes with a bit of Nutella, then roll them up. 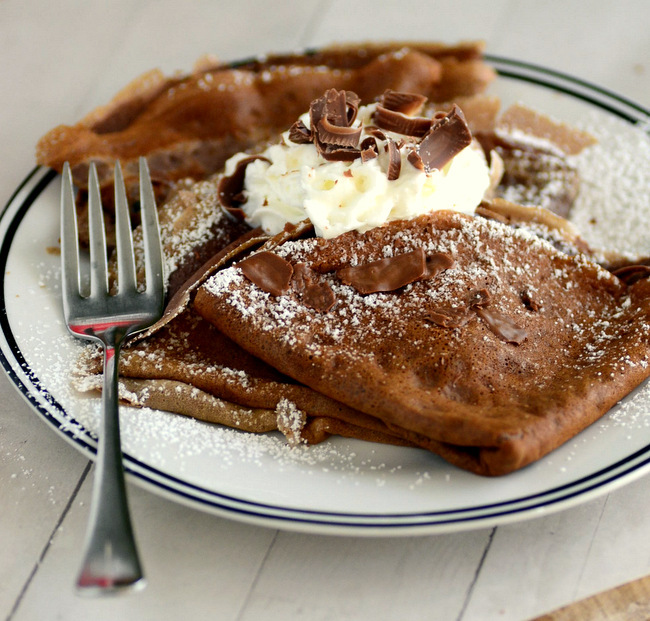 The creamy, chocolate and hazelnut spread makes these crepes exceptionally decadent. Adding whipped cream and some chocolate shavings to any of these options will make your crepes even more memorable. This recipe is relatively small and makes 8-10 crepes using an 10-inch nonstick skillet (approximately 8-inch crepes). You can definitely double or triple the recipe to serve a crowd. I highly recommend using a nonstick pan any time you are planning to make crepes to prevent them from sticking. If you use a larger or smaller skillet, your cooking time may be a little bit different than described here, but probably will not differ by much. The crepes should be served when they are fresh for maximum enjoyment. In a large bowl, sift together flour, cocoa powder, sugar and salt. Add in eggs, milk and vanilla extract and whisk vigorously until batter is smooth. Heat a nonstick 10-inch skillet on medium-high heat until water sizzles when dripped on the surface of the pan. Reduce heat to medium-low. Pour approximately 1/3 cup of batter onto the pan and turn pan to allow batter to coat the bottom of the pan evenly. Cook for about 60-90 seconds, or until crepe is set, then flip over and cook for an additional 30 seconds on the second side. Serve immediately, filled with Nutella or dusted with confectioners’ sugar.